While the Valle de Guadalupe takes all the fame and glory for being Baja’s wine region, some of the best wines I’ve ever tasted come from a winery in Rosarito (the only winery on Rosarito) called Claudius Viña y Bodega. Owner and winemaker, Julio Benito is a sixth generation winemaker whose family hails from Segovia, Spain. 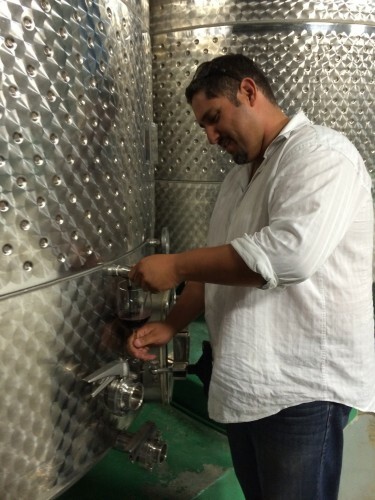 He’s been making wine in Rosarito since 2010 and finds that the conditions there are prime for winemaking because of the atmospheric pressure and the cool coastal temperatures. Benito currently sources his grapes from various vineyards in northern Baja (he just recently purchased land south of Santo Tomas which will be used for growing grapes and building a hotel), and his winemaking technique varies from other wineries in the region because of this. 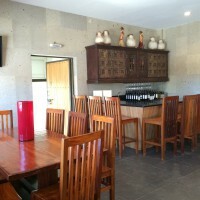 Many of the other Baja wineries produce blends because the wine region is new and winemakers are experimenting with different flavors and dealing with lower-quality grapes. Claudius, on the other hand, focuses on varietals, but a blend of the same grape from different vineyards. This helps Benito to create wine from only the best grapes, producing high-quality 100% varietal wines. Merlot, Nebbiolo, Cabernet, Tempranillo. All authentic and all delicious. When I visited Claudius winery, we met with Ernesto Diaz Perez, the sales manager, who showed us around on a personal tour. We learned about the winemaking process for Claudius, got to see the barrels and the tanks and got to try a number of wines directly from the taps. All of the wines were complex, smooth and delicious. For true oenophiles, the best part about Julio Benito and Claudius winery is that they’re sharing their knowledge and passion with their wine classes. People can sign up to attend wine school on the weekend for two months. At the end of it, you’ll have 25 cases (that’s 300 bottles) of wine that you made yourself. Claudius has a very nice tasting room and they have a restaurant that will be coming soon. They do accept credit cards. Tasting room hours are Wed-Sun, 10am-5pm, but they can usually accommodate you any day of the week if you call ahead by a few hours. It’s authentic Spanish wines with Mexican soul. ¡Buen provecho! The last time I was in Mexico I tried a bottle of Merlot. It was fantastic! !